One of the reasons that political parties cycle in and out of office is that there is a underlying discontent that comes with being a human being. The remedy for this discontent ultimately lies in the spiritual rather than political realm. Nonetheless, we look to our political leaders to cure what ails us and regularly turn them out of office when they fail to do so. A meaningful life is found in the quality of our relationships: Are we trapped in self-centeredness or do we have a faith that allows us be self-giving to our family, our church and our community. Similarly, the quality of our communal life is similarly based upon not on the political party in power but rather whether both the leadership and the citizenry truly care about the greater good of the community. We celebrate diversity and inclusion in our church and in the present age one of the forms of inclusions that is becoming increasingly less common is an inclusion that encompasses people who disagree with us about politics. So I’m glad our “room in the circle” extends to differences of political opinions. It is a beautiful thing. But there is more going on in this story than is typically recognized. In the first portion of our passage we hear Jesus go on a rant against certain scribes – the religious authorities involved in administrating the Temple. “Beware of the scribes,” he said. They are all about themselves. They don’t truly care about their community. In fact, they “devour widow’s houses.” They take everything these poor, vulnerable widows have and they will be severely judged for doing so. Our reading this morning calls attention to the dangers of turning our religion into a kind of public performance that is ultimately about calling attention to ourselves rather than to God. After calling out the pretenses of certain scribes, Jesus takes a seat across from the treasurery to watch as people dropped their offering. In those days there was no paper money; it was all coins of various size and density. The two copper coins would have barely made a sound as the widow dropped them into the metal bin. In contrast, heads would turn at the loud sounds made when the rich dropped multiple bronze, gold and silver coins. People knew who gave a lot, and who didn’t. In our church the only person who knows for sure what somebody has given is the Financial Secretary, thereby lessening the potential for making our giving a public performance by which to attain praise and status. The poor widow gave sacrificially, mirroring the sacrificial giving that Jesus will shortly demonstrate when he offers his whole life on the cross. Beyond the gaze of those who might praise us, we are each called to give sacrificially – both those of us who are better off financially and those less so. To those to whom much is given, much is expected, but something is expected of all. We offer our gifts in the trust that in the future the church will be there for us in our times of need in all its forms, whether financial, emotional or spiritual. We recognize that life is fragile, and we can’t make it alone, and if we have the good fortune in the present moment to be stable in all these ways, unless we are fools we know a time will come when we too will be in need of our faith community’s support. In the end, this story is a reminder that God sees what we overlook. 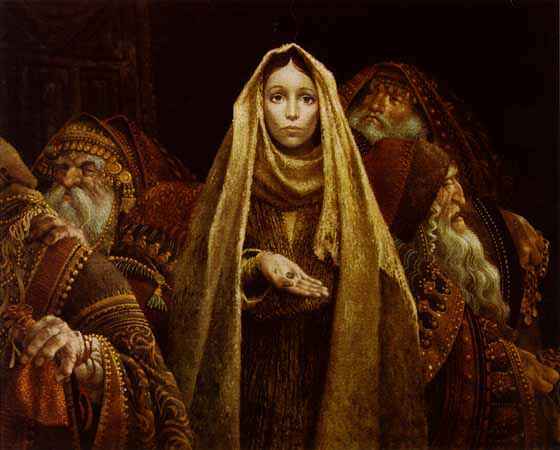 Jesus – God incarnate — sees the poor widow who is so easily overlooked. God calls us as the church to see such people as well and to hear their cries. Immediately after this story, the gaze of the disciples will be captured by the sight of the beautiful huge stones that make up the Temple. The point the Gospel writer would seem to be making is how easy it is for us to get distracted from what truly matters – to be dazzled by that which glitters and overlook the suffering of the least among us. But God sees us and God truly cares. God knows our struggles and God knows our gifts. There is reassurance and grace in this knowledge, but there is also a great challenge put to us as well. God is calling us to be faithful with our gifts, our time and our talents, that the church that was passed on to us may be passed on to others. Our calling is to love God and neighbor because in the end that alone is what matters.